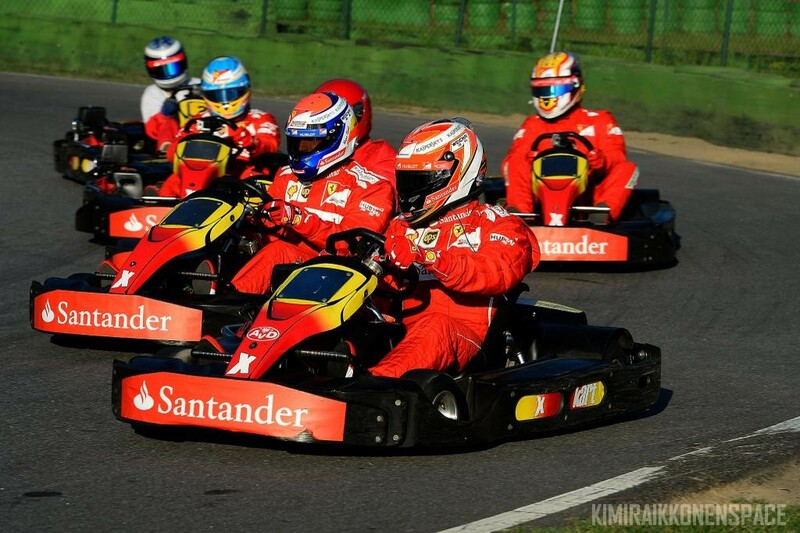 Fernando Alonso, Kimi Raikkonen, Jules Bianchi, Marc Gene and Raffaele Marciello join forces with the media in Germany for a Santander-sponsored karting showdown! Scuderia Ferrari’s sponsor for the past five seasons, Santander Bank, organised a karting event tonight at a track in Walldorf, a few kilometres from the Hockenheimring, home to this weekend’s German Grand Prix. Winners of the event were Scuderia test driver Marc Gene and Catalan journalist from TV3, Albert Fabrega. Competitors were split into groups of four of different nationalities, with one team principal for each group. The best drivers from each country then took on a team of Scuderia Ferrari drivers, featuring Fernando Alonso, Kimi Raikkonen, Jules Bianchi, a Scuderia test driver, on loan for the night from the Marussia F1 team, Marc Gene and Raffaele Marciello, a Ferrari Driver Academy student, in Hockenheim for round 6 of the GP2 series. The winner was decided by adding the points scored by the journalist to those of that nation’s allocated race driver, decided by a draw before the start of a race where the victory went to Fabrega.